Indian Media has reported that Indian Police has Caught a Pigeon on Friday near Pakistan border that was Spying for Pakistan. 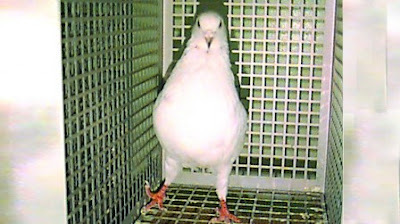 The White Colored Pigeon was caught by a Local Citizen of Indian Punjab from where it was taken to Amritsar Police Station by Police. According to Media reports this Pigeon was having a ring in its foot a address and a Phone Number stamped on body. The Pigeon is medically examined and is kept in a room in Police station that is having Air Condition. Indian Police officer told (PTI) that the Pigeon not looks like Indian Pigeon and it is very possible that it Landed in India from Pakistan. Before this Pigeon some Indian Diplomats and India army officers where also caught for spying for Pakistan.